I can’t believe it! 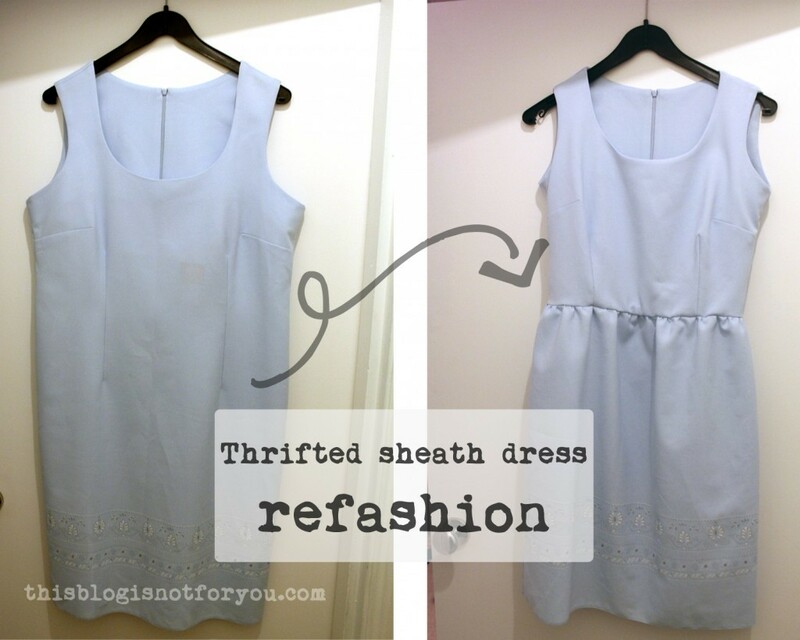 After all these years I actually never bought and refashioned a thrift store dress! Normally I just buy oversized shirts or dresses at Primark or H&M, but this time I gave it a try. Since we just moved I walked around the area a little yesterday and found a small thrift store. 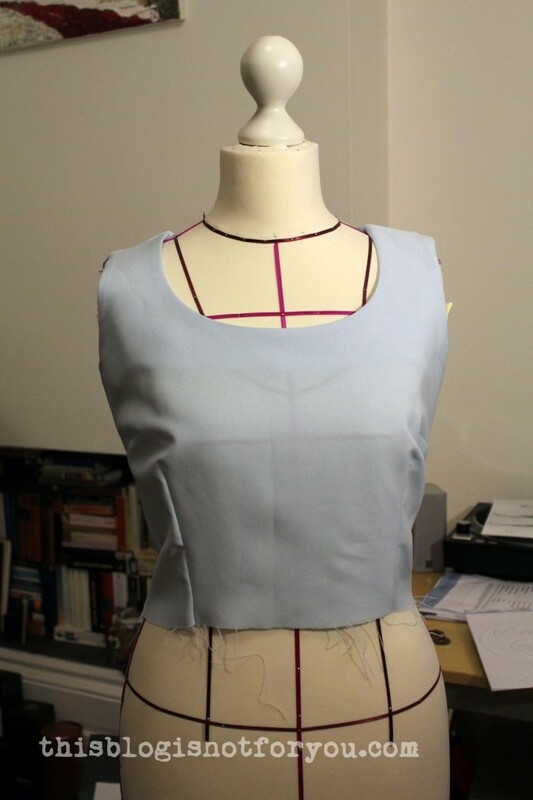 I figured that with a bit of patience I might find a good-quality fabric for a few pounds and I was right. 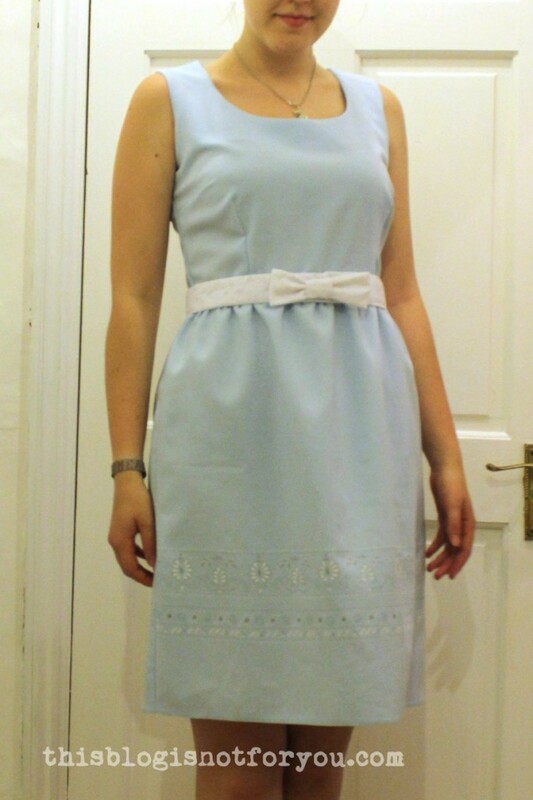 I found a Berkertex dress, size 16, for only 5 pound. 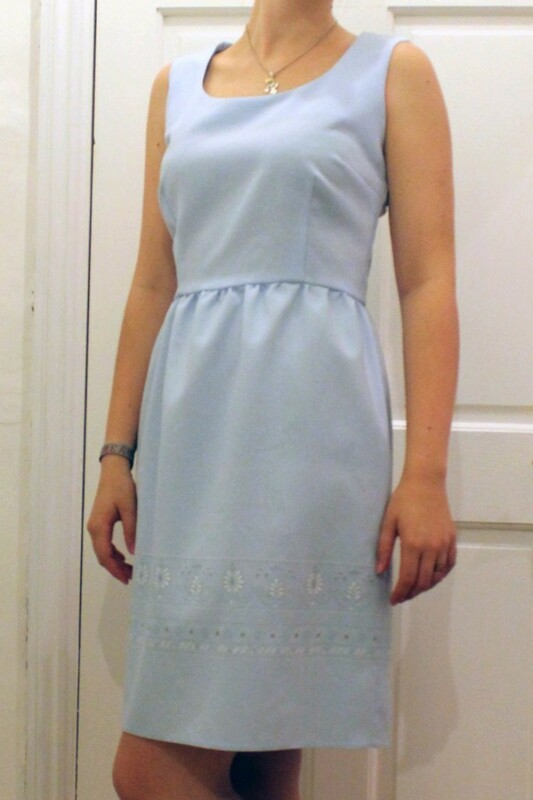 Normally these dresses are really expensive and the fabric was a really lovely light blue Idontreallyknowwhatitis. 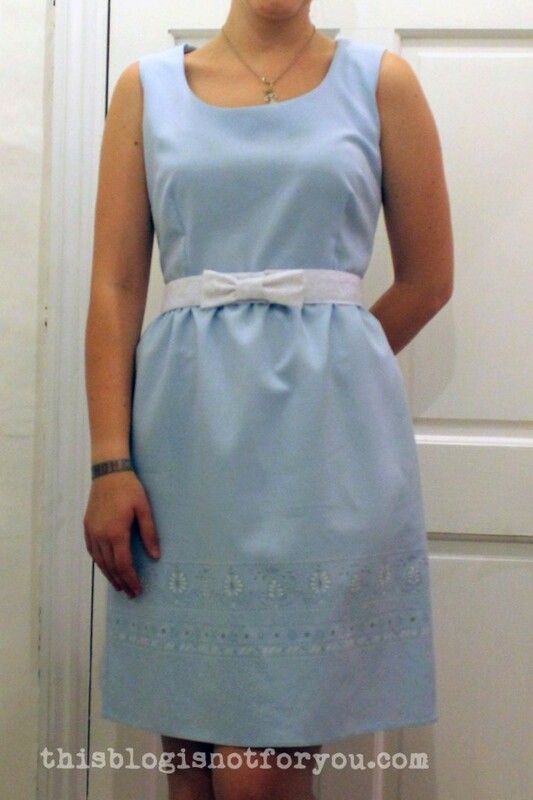 The tag on the inside says chambray/100% Polyester, but it doesn’t really look like chambray to me. Someone help me please? Anyway the fabric is awesome. It dries super quick (basically came out of the washing machine dry) and doesn’t wrinkle at all – no pressing needed! Yeah, I know. Stop talking and show us the pictures! So here’s what I did! 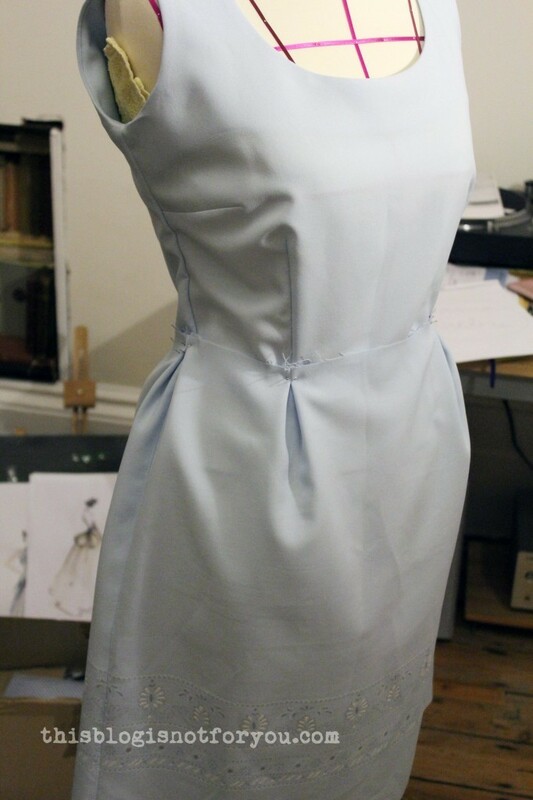 First of all I did some pinning on the dress form. As I’m a size 8-10 I obviously had to take in the sides. The front darts weren’t quite right and a bit too low. I decided to take in the straps and the dart problem was gone! 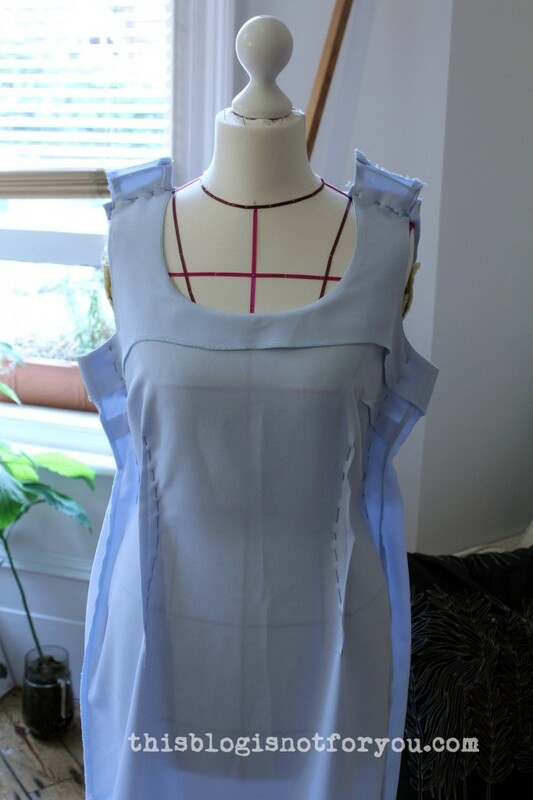 To give the bodice a bit more shape I took in the front darts a little. After pinning I tried it on and the fit was really good (yay! no changes needed!) Before removing the pins I transferred all changes with a pencil. …it made my hips look twice their size! Meh! 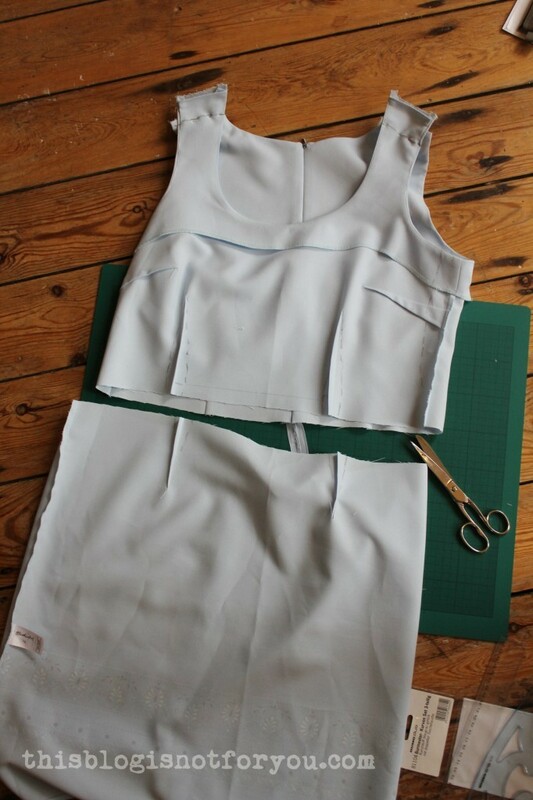 I decided to play safe and simply make a gathered skirt. This looked best with the rest of the dress. 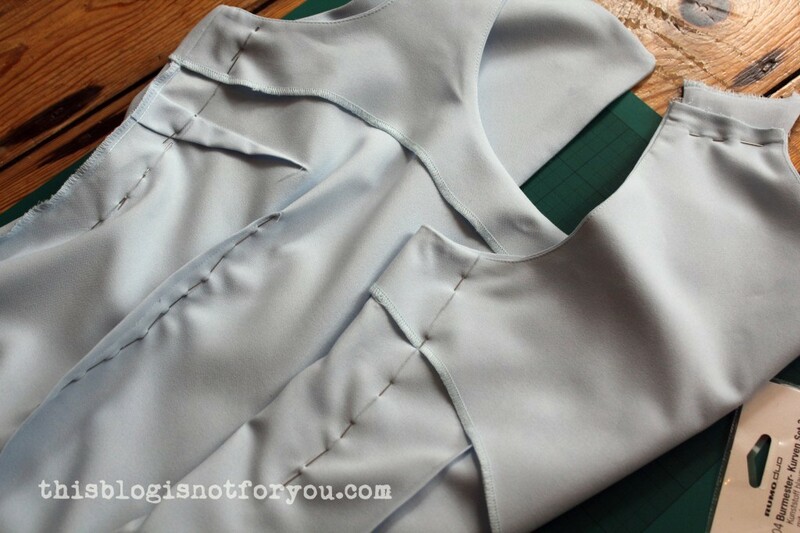 Pinning and stitching. 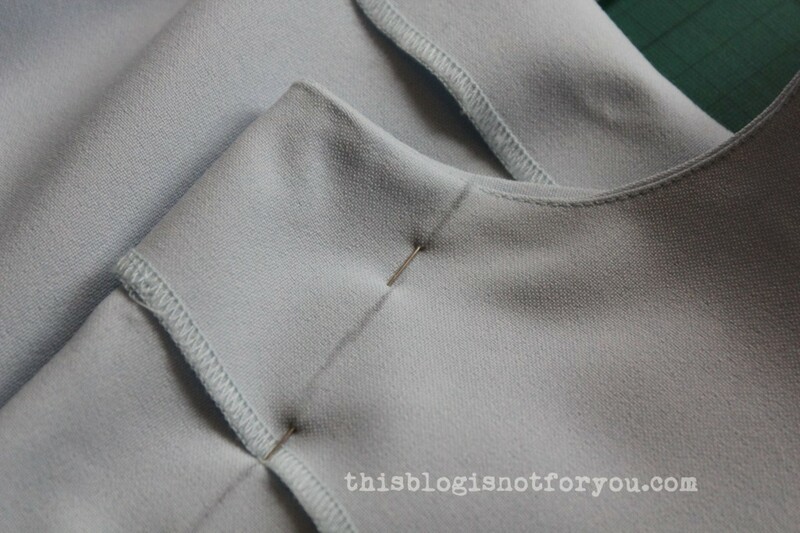 I used white cotton bias binding to finish the raw edges since the fabric was fraying like f%$§&f!. 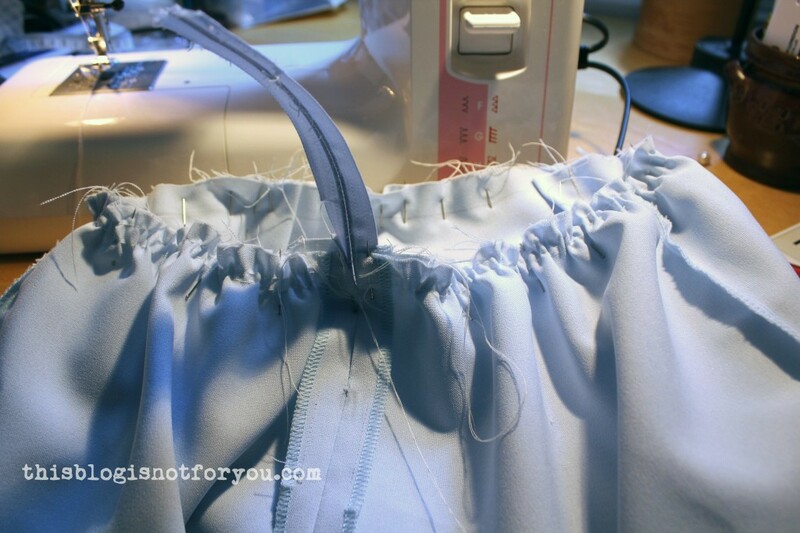 I sewed in the rest of the zipper – and was finished! 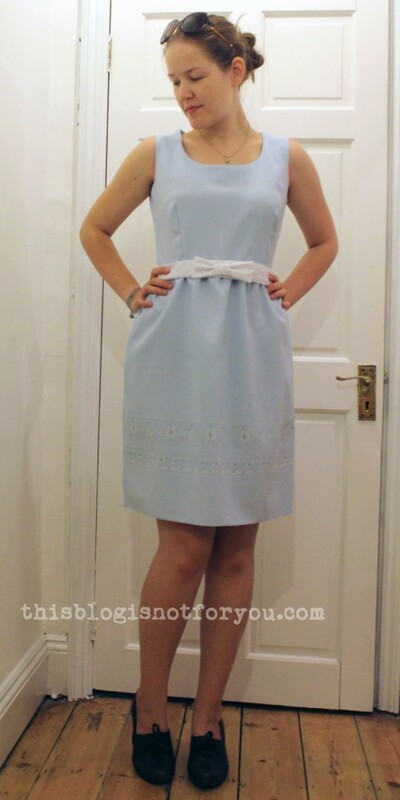 It’s super comfy and although I NEVER wore light blue before, I just love it! 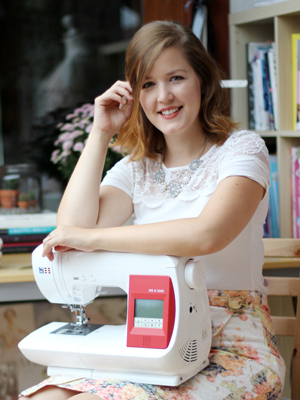 I made the belt from white cotton and lace fabric using Tilly’s awesome bow belt tut! Fabulous! I have a Betsey Johnson dress I thrifted- it’s too tight & I need to figure out what do with it! I love what you did-I even like the big hip version! 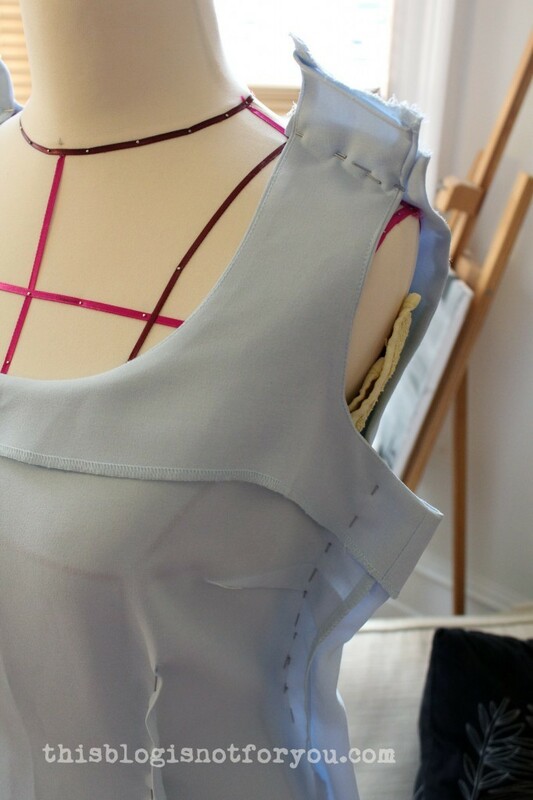 thank you 🙂 Have you thought about inserting strips of fabric at the sides, eg. lace or a contrasting colour? 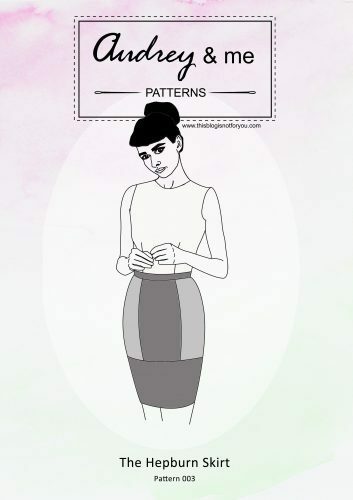 I think that’s the easiest way ti widen a dress without completely altering its shape. 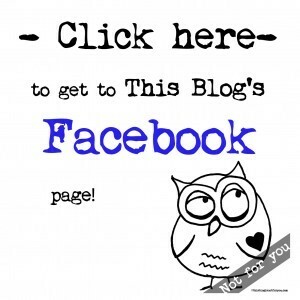 Just goggled refashion blogs and came across your great blog! 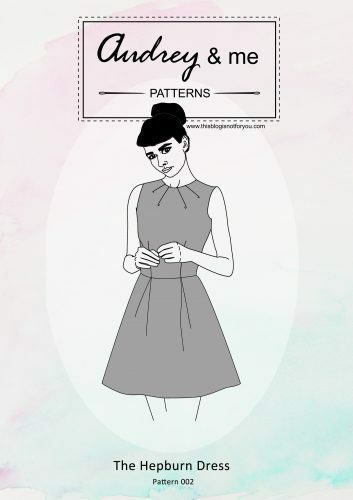 I’m excited because I recently picked up a similar dress to refashion! Such a cute idea. I may have to borrow it. Mine is red linen though and not likely to wash up and wear so readily… but, that’s o.k.